I had a Casteless Lunar with an Owl totem. He left the group to go join the Silver Pact and get tattooed (after getting amnesia; this was 2nd ed and he kept shapeshifting without tattoos). Maybe he can come back with an Owlbear totem! After reading the castes, I kind of want to see Magilou from Tales of Berseria as a No Moon now. Yeah, she acts like a cartoon character, but it's not exactly hard to see the cunning trickster and master of the arcane beneath her stage magician persona. It's only revealed later how mythological a trickster she is; Loki in a dress and with the moral of the story on her side. Hummingbird Changing Moon General who is a great strategist, inspirational leader. Sparrow Casteless Immaculate Monk who has to deal with all the baggage that his religious upbringing entails. A port of my Fenrir Theurge as a No-Moon. Not sure what animal his spirit shape would be. Not wolf. Probably bat or Merlin. He will have a solar bond with an Midnight Abyssal, which is a port of the Thuerge's BSD half brother. Second, is a Macaw/Tyrant Lizard Chimera Full Moon. Yes, their totem is basically a giant, brightly colored feathered dragon. Strength/Stamina Caste, Appearance-Favored. Outside of remaking my 2E Lunar (a Charming Prince type Full Moon with a shark totem), I'm also looking forward to making making a Hellboar Lunar who can be pretty much summed up with this picture. I want to make a Lunar who goes on a sacred hunt to get an Ankylosaurus shape. The idea of playing an Ankylosaur in a sword and sorcery setting is too awesome. EDIT: Also, a Giant kittycat. Just because of that one piece of art. Back in First Edition, I got roped into designing a character for a Heroic Mortal game by a friend who was an obsessive Werewolf: the Apocalypse fan. That was Tain, a Marukani sellsword working for the Haltan military on contract. When the character got shoved into a Lunar exaltation in spite of me saying at the outset that he was best suited as a Dawn caste. I was completely dumbfounded trying to come up with a Spirit Shape. I asked for Tyrant Lizard because I liked the idea of a T-Rex's stoic silence contrasting with its power and fury. I got told that wasn't allowed, and I'd have to settle for alligator. In second edition, I revamped Tain as a Solar, and he worked pretty well. This time, I'm bringing him back to Lunars, and he's getting his goddamned T-Rex spirit shape because it is explicitly allowed. I kind of want to make a bat-totem necromancer Lunar who invokes every gothic vampire stereotype known to man. Especially he using his blood to turn a bunch of people into lesser "vampires," in reality an enormous army of batfolk. He's also quite possibly one of the nicest guys you'd ever want to meet, and evokes the image because it scares away would-be monster hunters, and makes the Wyld Hunt think he's blood-obsessed. I've got the foundations of my next character that started forming last night. What I have so far: A Changing Moon Parrot Totem stage actress who got into trouble for a satirical take on the founder of the Great House that her homeland is a Satrapy of (anyone but Mnemon really, my last Changing Moon and her had a special relationship). She's quite possibly the most annoying thing alive when she really wants to be. 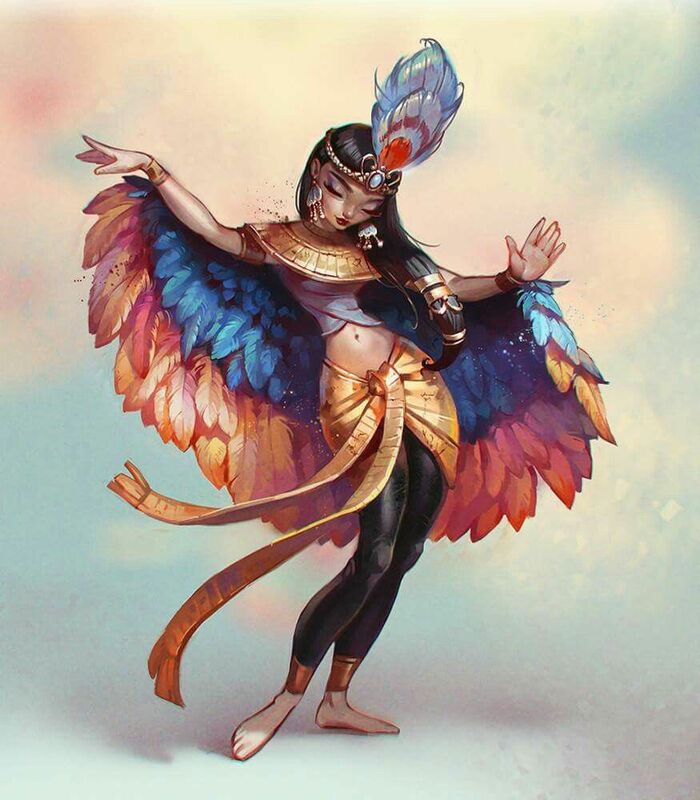 I love KittyEmpress' avatar for a Parot-totem Lunar; the artist produced at least one other picture of the character, too. With what has been revealed in the previews so far, I have created a powerful Rhino-themed Full Moon with an arm made of Moonsilver (similar to Arete from Arms of the Chosen [pg 118]). Still trying to decide on a Tell for this character... anyone have suggestions? Of course, this is just with the unfinished manuscript previews... once the book is in its final form I will of course refine the character I have created. Hopefully by that time, I will have thought of a Tell for this character. There are three types of people in the world... those who can count and those who can't. There's a recurring kinda-sorta character that I have that's a vaguely humanoid being with no arms, a ton of head-tentacles, and many big creepy eyes, something halfway between Lovecraft and the weirder bosses in Legend of Zelda. Well, not only it turns out the general concept is very doable as a hybrid shape, thanks to a lot of freedom being given for aesthetics, but it's the perfect excuse to take all of the grapple-related mutations/charms and have fun with it, having so far never made a grappling-focused character in Ex3. I don't even care if most of the eyes have to be moonsilver tattoos, that's just an added layer of cool to add whenever they all start appearing. Khaas Finds-the-Prey, rakashan scout (Savage Worlds setting The Last Parsec) becomes a Full Moon leopard-totem (maybe cheetah-totem) scout/tracker. Taicho Nightfeather, tengu ninja (Pathfinder) becomes a Full Moon raven-totem infiltrator and assassin.